Ultrasound or ultrasonography is a form of radar technology, in which silent, high frequency sound waves are transmitted into the body and then bounced back at different times and intensities by the various tissues within. Those returning signals are then processed into 2D images that show the architecture of different structures in the body. Ultrasound is non-invasive and completely painless, and the resulting images can be extraordinarily helpful to the trained eye in assessing the health of organs within the body. The procedure is especially well suited for internal medicine specialists like myself, whose job it is to diagnose and treat diseases of the internal organs. Diseased organs will usually show changes on ultrasound, although there are always exceptions, and thus limitations do exist and always need to be kept in mind. Like all other diagnostic tests, ultrasound findings are essentially information, which always need to be interpreted in the context of the patient’s symptoms, history and other findings. Some of the common factors that can interfere with ultrasound accuracy include gas and bone, obesity or excessively thin body condition, very large body size, excessive fluid retention in the body, deep-chested body conformation, lean or muscular patients, and acute (recent onset) disease. Appointments must be scheduled through your veterinarian’s office. Pet owners are usually requested to drop off their pets at the clinic at least a couple hours prior to the procedure. Unless your pet is diabetic, or you are otherwise directed by your veterinarian, it is important that he or she not be fed the morning of the procedure, as a full stomach can interfere with the evaluation. It is OK to allow them to drink water. The area to be evaluated is typically clipped, as fur will usually prevent a good ultrasound signal. Generally, just the underside of the abdomen will need to be clipped. Your pet will be placed in a very comfortable, padded position and gently restrained by an assistant or veterinary technician while the scan is performed (some dogs actually will fall asleep). The procedure is noninvasive and painless. Most pets can be scanned without any type of sedation, although this is sometimes needed for those pets who are especially stressed or painful. Sedation is often, but not always, needed if a needle sample is desired. Owners are not present during the evaluation so that we can focus completely on performing the most thorough evaluation possible. In addition to a thorough verbal discussion of findings with your veterinarian that usually takes place during the scan, a complete written report is provided to them. This report not only provides the ultrasound findings, but also covers additional recommended tests and treatment options based on my over 27 years of clinical specialty experience. Your veterinarian will discuss the findings and additional recommendations for your pet with you. 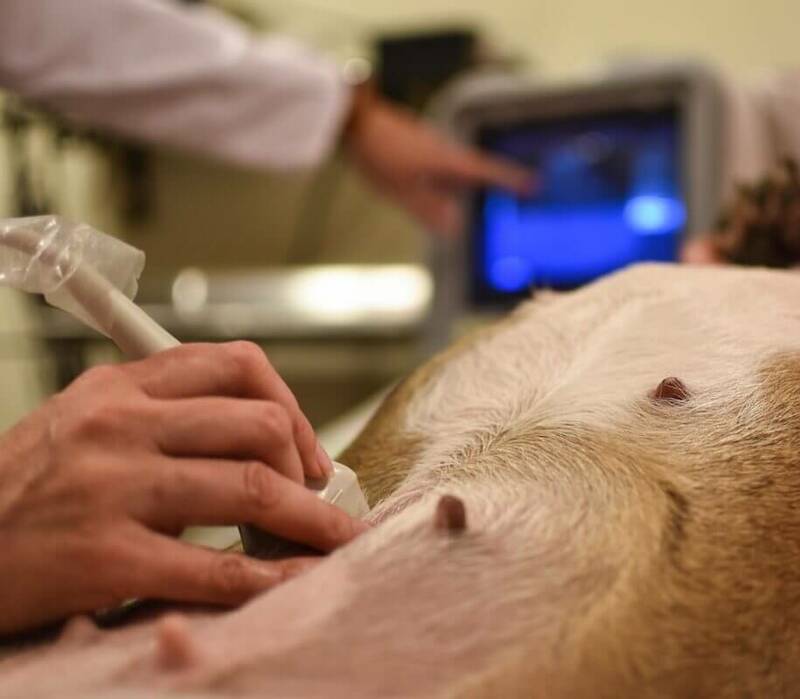 Why can’t my vet perform the ultrasound? As with all skills, proficiency requires training and repetition, and with ultrasound there is a steep curve in learning how to consistently and properly image tissues, and more importantly interpret the findings in the context of the patient’s problems. In addition, as discussed elsewhere on this website, a board-certified internist brings a unique skill set to the evaluation to provide a truly comprehensive evaluation of the patient’s internal organ function. And although ultrasound machines have become more affordable over the years, they still require a very significant financial investment. Why can’t the appointment be scheduled at a specific time? In addition to emergencies and unexpected delays that are common in all medical settings, mobile practice brings its own set of scheduling challenges, particularly delays due to weather and traffic. Thus, an ETA window is given, although this can sometimes change as the day progresses and this is why it is best if pets are already admitted to the clinic before the scheduled appointment slot. Does the ultrasound hurt, and will my pet require sedation? As a general rule, no to both of those questions, although there are exceptions. Some conditions are inherently painful, such as pancreatitis, so in these situations the patient may experience pain. However, sedation helps in these patients, as well as those who are very anxious or fearful. Sedation is also often needed if needle samples are collected. Technically, the correct answer is no, as a definitive diagnosis of cancer requires microscopic evaluation of cells. This is one of the most common reasons needle samples are often collected during the evaluation. However, depending on the specific circumstances, cancer will often have very characteristic abnormalities found on ultrasound, so often we will make a presumptive diagnosis of cancer based on ultrasound and other findings. What are the limitations to ultrasound? Like any test, ultrasound provides information, and that information always needs to be interpreted in the context of the patient’s history, signs and other diagnostic findings. The information that ultrasound provides is basically the structure and architecture of tissues within the body. There is often a “gray” zone in many diseases, in which there is overlap in how healthy vs. diseased tissue appears on ultrasound particularly in the early stages of disease. And form (structure) does not always correlate with function, so an organ that appears normal in structure is not necessarily functioning normally. This is most commonly a problem with diseases that are acute (recent) in onset. Other common limitations of ultrasound include interference by gas and bone (ultrasound waves do not penetrate gas or dense tissue like bone), obesity or excessively thin body condition, very large body size, excessive fluid retention in the body, deep-chested body conformation in which the ribcage interferes with imaging the upper abdomen, and lean or muscular patients. Can I be present for the evaluation? Owners are not present during the evaluation so that we can focus completely on performing the most thorough evaluation possible. The ultrasound itself takes 15-20 minutes in most cases. However, there is also time spent reviewing the medical record, discussing results with your veterinarian, and typing a report, so the entire process generally takes 45-60 minutes. In addition, if needle samples are obtained, these require extra time. Can a biopsy be obtained during the ultrasound? There are actually two types of needle samples that can be collected via ultrasound. A needle aspirate uses a very thin needle, often the same size as those used to give injections but longer, to obtain a very small sample of tissue for cytology. The sample usually resembles a small spot of blood or fluid. This procedure can usually be done during the ultrasound and usually has very low risk of complications. Sedation is sometimes needed. A needle biopsy uses a larger needle, and this collects a tubular sample of tissue about the size of the lead in a pencil and approximately ¼” to ½” in length for histopathology. This procedure is only scheduled after the ultrasound is completed, typically requiring another visit. The procedure is generally considered safe, but it does pose some additional risk for bleeding or infection. Your pet’s clotting system will need to be checked before the procedure, and deep sedation or anesthesia are needed as well. Can I speak directly with the specialist following the evaluation? Unfortunately no, as this service is designed as a vet-to-vet consultation rather than a client visit. One of the major benefits of the service is that your vet is very often present during the procedure and will see findings in real time, which is enormously beneficial in understanding your pet’s problems and formulating a treatment plan. Will treatment recommendations be made for my pet? Yes. Probably the single most important benefit of a specialist evaluation is the additional expertise that will be provided in assessing the findings and formulating a plan to provide the best care for your pet. This often includes both additional recommended tests and specific treatment recommendations.